Climate change, also known as global warming, has the potential to impact every living thing on this earth. Because of climate change, our world is seeing more extreme, erratic, and unusual weather. Florida’s two largest industries – agriculture and tourism – are completely dependent on climate. Climate change can cause droughts, floods, extreme weather, coral bleaching and other problems that could negatively impact our economy, our health, and our state. Climate change was once a controversial topic, but today it is widely accepted by the scientific community. Global warming is caused by an increase in heat-trapping pollution that is changing our global atmosphere. A carbon footprint is a measurement of the greenhouse gas emissions produced by an individual, event, organization or product. A carbon footprint is the amount of global warming pollution that is produced through daily habits such as travel, eating, and electricity consumption. You can also measure the carbon footprint of an organization, like a school district, or an event, like a concert or a sports game. You can calculate your household's carbon footprint by visiting the following website. The Earth has natural warming and cooling cycles. These cycles warm and cool the planet over tens of thousands of years. It is important to understand that the warming we are experiencing today is outside of the realm of natural cycles. The rate of warming has reached a point that has alarmed scientists because it is taking place so rapidly. For a detailed scientific debate on natural cycles, click here. Florida is one of the most vulnerable states to the impacts of global warming, especially sea level rise. The polar ice caps are melting at an accelerating rate. Animals such as polar bears are struggling to survive. As icebergs melt, the polar bear loses the precious habitat it depends on for shelter, hunting, and raising their young. Even though polar bears are some of the best swimmers around, many adults and baby polar bears drown or starve as the ice caps shrink to smaller areas with every passing year. Near the equator, plants and coral reefs are trying to adapt to much warmer waters. As plants and animals migrate to cooler, safer habitats, they sometimes are forced to leave protected areas. This puts them in contact with humans, which can be dangerous for both parties. Sea level rise can flood coasts around the world, displacing millions of people. As the ice caps melt, oceans are inundated with more fresh water, which disturbs the natural ratio of salt water to fresh water in our oceans. Another climate change impact that South Florida will encounter is salt water intrusion caused by rising seas that inundate coastal land and penetrate the Floridan aquifer. 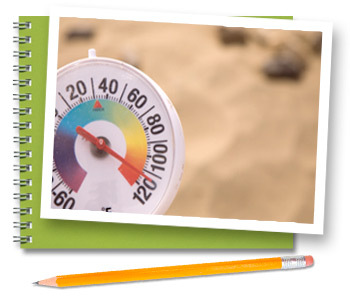 To learn more about potential global warming impacts click here. For more in-depth scientific information, visit this site. The greenhouse effect occurs when certain gasses, called greenhouse gases (GHGs) trap energy from the sun, and prevent it from escaping back into the atmosphere. The major GHG is carbon dioxide, but methane, water vapor, nitrous oxide, and ozone are also GHGs. The greenhouse effect makes the planet warmer than it would be without these heat-trapping gases building up in our atmosphere. Think of the greenhouse effect like a blanket that keeps the earth warm at night. The greenhouse effect is generally a good thing because without it, our planet would become extremely cold at night, when the sun goes away. Because the green house effect traps heat within our atmosphere, we do not freeze at night in the absence of the sun. But too much greenhouse gas can also make our planet too warm. To learn more about the greenhouse effect, visit the EPA website. What Broward Schools Are Doing. Expand the current recycle and reuse policy for vehicle parts (tires, oil, alternators, and windshields). Purchase additional hybrid vehicles to replace obsolete vehicles. Expand energy, fuel conservation, and emission control initiatives District-wide. Upgrade all District Energy Management Systems. Develop energy efficient building and landscaping specifications and criteria. Participate in the Broward County Climate Change Task Force. Implement the School Board of Broward County/Broward County NatureScape partnership. Mitigate the District’s Carbon footprint with innovations and new technologies. Support clean energy. Purchase green energy packages through your local utility company. Visit our Renewable Energy page to learn more. Save money on your electric bill. One of the best things you can do to prevent global warming is save money on electricity bills by becoming more efficient in your home and school. Visit our Energy Conservation page and our School Dude page to learn more. Buy local products. Sometimes the things that we buy travel a long way to get into our homes. Buying locally made products decreases the fuel needed for transport. Visit a farmers market. Local fruits and vegetables are fresher, taste better, are better for your health, and support the local economy. Buy sustainable products. Avoid products that use virgin materials or products that are petroleum based. Look for pre and post consumer recycled product labels. Visit our Recycling & Waste page to learn more. Talk about it. Talk to friends, parents, and kids about global warming impacts and what you can do to prevent it and protect our beautiful state. Be the change you want to see in the world. Grow native plants. Mitigate your carbon footprint by planting native plant materials. Restore nature. Help to restore indigenous habitats.